Back in May I awoke in a cold sweat, sick to my stomach and unequivocally dehydrated. It was less a nightmare, more a calling. What the hell ever became of the Morbegs? After seven weeks, RTÉ remained coy on the matter, declining my invitation to shed some light on the whereabouts of these enthusiastic, mythical beasts. I began to wonder, had I finally gone insane? 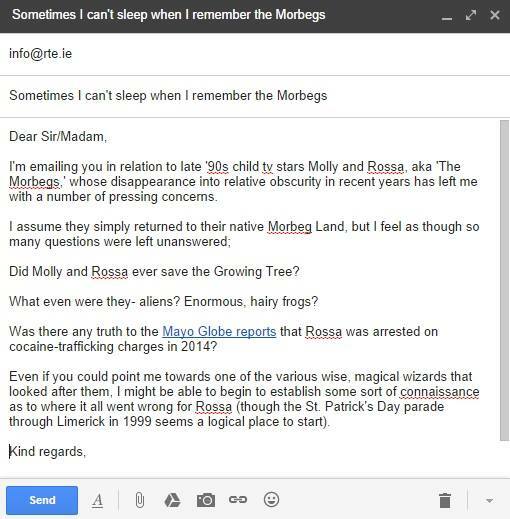 Were the Morbegs a figment of my imagination? But the wizards seemed so real! Thankfully, this 6-second Youtube clip - the only existing footage of the Morbegs in action bar the dozens of video cassettes rumoured to be buried in the Wicklow Mountains - put my mind at ease, if only briefly. Through connections in Baranquilla, Colombia I was able to locate one of Rossa's associates, and discovered the startling truth. It was all over when he set the Growing Tree on fire after a night on the razz in Flannerys. That was the point of no return. He needed our help to understand, but he didn't get it. He really made shite of that Growing Tree, you know? I've heard he's over [in Colombia] alright, running for the Bíjata Santa Martín crew. But whispers he was in Medellín proved untrue, at least from what I saw when I went down there and put the feelers out. Of course, 'Rossa' sounds very like the Spanish word for 'red,' so they just kept bringing me wine. It was actually grand. So, like many child stars before him, young Rossa went off the rails. An enormous waste of talent? Yes. But at least I knew he was out there, running, his glistening orange...fur...(? )...billowing in the wind. But what of his sister? A connection in the media claims that Molly is one of the hosts on Xposé, but nobody at TV3 or in fact anywhere on Earth could confirm nor deny the accusation. Others claim it is in fact Molly who reads the weather forecast on Morning Ireland. Ah, she did pretty well for herself. She's actually Amy Huberman. The word morbeg is derived from the Irish words mór, meaning big or large and beag, meaning small or little. It is one of a hundred contradictions I've encountered on my quest for the truth. We may never know what happened Molly and Rossa - or that fecking Growing Tree - but at least we can be safe in the knowledge that they're out there somewhere, wild and free as nature intended.